AIIEA is completing diamond jubilee year of its existence in another few months. It is during this period that the 22nd Conference of AIIEA was held at New Delhi. Hence this was the Diamond Jubilee year Conference and has all the significance attached to it. It was after 36 years that the Conference was being held at New Delhi. Last time when the conference was held at New Delhi in 1974 the Conference was in the background of a historic wage settlement defeating the lock out in LIC and this time too the conference was held at Delhi in the background of a historic wage revision for the public sector insurance employees. General Conference of AIIEA held at Kanpur. It had the participation of a record number of delegates and observers. 214 women delegates and observers participated in the conference. This record women presence is a clear indication of the growing participation of women in the decision making of the organization. The level of discussions showed the maturity achieved by the organization and its understanding on events that profoundly impact the entire humanity. The presence and guidance of former office bearers of AIIEA, including the founder leader Com. Chandrasekhar Bose and Com. N.M. Sundaram greatly enthused the delegates and observers. 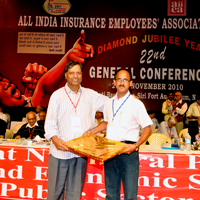 An impressive rally of the insurance employees was taken out on 20th November 2010 preceding the inaugural session. The rally started from the imposing Jeevan Bharti Building on the Parliament Street to Ramlila Maidan with participation of more than 6000 employees. The rally gave a glimpse of the unity of the insurance employees across the country as also the commitment of the cadres and members of AIIEA to the issues in the society. Members of various jathas from the Northern Zone which campaigned about the public sector insurance and came from various divisions including the farthest centre of Jammu were felicitated before the start of the rally. The massive rally reached Ramlila Maidan with clock like precision and exactly at 5.00 pm the AIIEA flag was hoisted by the President of AIIEA. Immediately thereafter the inaugural session began after paying homage to the departed leaders. Shri M.K. Raina, famous stage and film personality welcomed the gathering on behalf of the Reception Committee. He said that domestic savings play a very important role in the formation of capital and for investments in the infrastructure. He appreciated the struggles launched by AIIEA against the FDI gaining control over the savings in the insurance sector. Shri Manik Sarkar, Hon’ble Chief Minister of Tripura inaugurated the Conference. He detailed the policies of the UPA government which are making the lives of the common people miserable. He stressed on the need for food security and called upon insurance employees to fight for the demands of the common people while participating in the struggles on their own issues including the protection of the public sector insurance industry. Com. Tapan Sen, General Secretary, CITU, Com. V.A. N. Namboodiri, President, BSNL Employees’ Union, Com. R. Muthusundaram, General Secretary, All India State Government Employees’ Federation and Com. Pradip Biswas, General Secretary, Bank Employees’ Federation of India greeted the conference and called up on the insurance employees to strengthen the general movement of the working class in fighting the anti-people policies of the government. Com. K. Venu Gopal, General Secretary, AIIEA said that the Diamond Jubilee Conference of AIIEA was a Conference of Confidence and that the insurance employees would be active partners in the struggle against the neo liberal policies being actively pursued by the Government. Delegates Session commenced in the morning on 21st November 2010. A total 1710 delegates and observers attended this session. On behalf of the Working Committee, General Secretary of AIIEA placed the report of the Working Committee before the Conference for discussion. The report dealt with the issues relating to the crisis of the capitalism and resultant impact on the workers. It has also noted the struggles across the world against the job losses and attacks on pensions. The report also discussed the UPA government’s love with the neo-liberal policies and the impact on the people of the country in the form of rising prices, job losses and the withdrawal of the government from its responsibility of intervening in favour of the people. The report also noted the policies of disinvestment being vigorously pursued by the government having the potential to threaten the very economic sovereignty of the nation. It noted the growing united struggles of the working class including the latest nation wide strike on 7th September 2010 to fight the anti-people and anti-worker policies of the government. In the background of the Government’s continuing faith in the policies of liberalization, the report emphasised the need to strengthen the Left political parties. Report noted with satisfaction the campaign and struggle against further opening up of the insurance sector and the gains made so far in the form of a unanimous report against the provisions of the LIC (Amendment) Bill 2009 and also the fact that the Insurance Laws (Amendment) Bill 2008 could not be taken forward so far. The report also noted the correct political and tactical line of AIIEA in clinching a historic wage revision for the insurance employees. Fifty one comrades including five women delegates participated in the debate on the report. Com. Chandrasekhar Bose, Com. N.M. Sundaram, Com. R. Govindarajan and other leaders addressed the conference and enthused the delegates and observers. All the former office-bearers of AIIEA who attended the Diamond Jubilee Conference also addressed the Conference. Com. K.K.N.Kutty, Secretary General of Confederation of Central Government Employees and Workers also addressed the delegates session. General Secretary of AIIEA while summing up the debate called upon the members and cadres of AIIEA to utilize the victories scored for consolidation of the Organisation. He called upon the units to oragnise various programmes and observe 1st July 2011 as the culmination of the Diamond Jubilee Year involving the employees and the family members. He also proposed programmes of action on the various issues of the employees and also on the campaign and struggle to protect the Public Sector Insurance Industry. The report was unanimously adopted after the clarifications and summing up by the General Secretary. The proposals for various programmes of action were also approved by the Conference. The Conference unanimously elected a working committee with the following office-bearers for the ensuring term. Twenty one resolutions on various issues were discussed and unanimously adopted at the Conference. They include the issues relating to opposing the increase in FDI in insurance sector, demanding merger of four Public Sector General Insurance Companies, recruitment in LIC and GIPSA companies, absorption of temporary employees in LIC, absorption of Part Time employees, improvements in Pension Scheme 1995, demanding recognition of AIIEA in LIC, solution to problems relating to LICHFL loans etc. List of resolutions will be circulated separately. The Conference decided on the following programmes of action on the issues of the employees and issues concerning the industry and the people. Demonstrations during lunch hour at all centres. JANUARY 2011 TO JUNE 2011 Trade Union Classes at all branch centres culminating in a State/Zonal level classes. AIIEA is presently affiliated to the TUI (Public and Allied Employees). WFTU decided to organize a separate TUI for the financial sector and held a preparatory meeting in March 2009 at Athens which was attended by the General Secretary of AIIEA. Now, the first Congress of TUI (BIFU) is being held at New Delhi on 24-25 February 2011. The 22nd Conference decided that AIIEA will now be affiliated to the TUI (BIFU) and would participate in the first Congress to be held at New Delhi. Com. K. Natarajan, General Secretary, AIIPA attended the Conference and greeted the delegates and observers. He recalled the achievement of AIIEA in clinching the Pension Scheme and expressed confidence that AIIPA and AIIEA will together work for the desired improvements in the Pension Scheme. He pledged the support and cooperation of the units of AIIPA in all the struggles of AIIEA in protecting the public sector insurance industry. The Conference decided to shift publication of Insurance Worker to Bengaluru in a few months time. Com. Amanulla Khan will be the Editor and Com. N.K. Vedaraj will be the Publisher of Insurance Worker respectively, once the publication is shifted to Bengaluru. The Conference acknowledged the untiring services being rendered by Com. K. David, Com. V.D. Somasundaram and other comrades associated with the publication of the Insurance Worker since the time the publication was shifted to Chennai. Cultural nights were organized by the host units on 22nd and 23rd which gave a glimpse of varied musical and dance formats of the country. Around three hundred eighty volunteers, majority of them from Delhi and from other divisional units in the zone worked round the clock for the success of the Conference. Comrades of NZIEA deserve all praise for this success. We convey our congratulations to all these comrades. A meeting of the volunteers was arranged on 25th November 2010 and the volunteers were felicitated by Com. N.M. Sundaram, Com. Amanulla Khan, Com. K. Venu Gopal, Com. V. Ramesh, Com. R.C. Sharma and Com. Anil Bhatnagar. Comrades, the 22nd Conference of AIIEA held at Delhi was a Conference of Confidence, a Conference of unity in thought, and a Conference which prepared the organisation to meet the challenges of the future and above all it was a Diamond Jubilee Year Conference of a Diamond in the Indian Trade Union movement. complete picture of the conference was drafted brilliantly by AIIEA and just designed by me. AIIEA is known to be a rich organization enrichened by talented comrades across the Country.